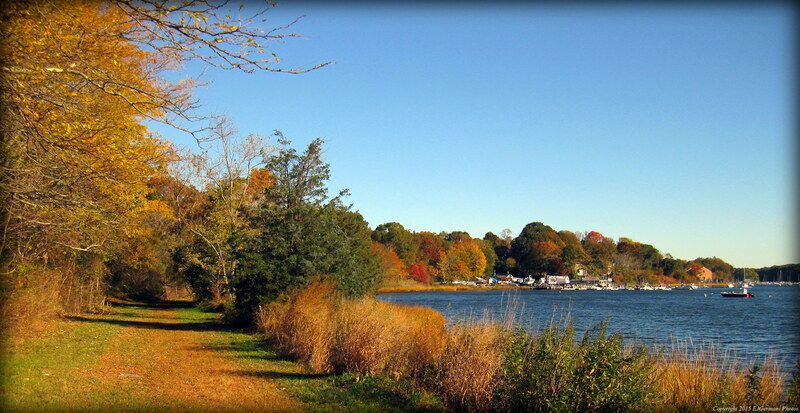 This aptly named park sits between the busy Route 1 and the marinas of Upper Point Judith Pond. The park has just about a half mile of paved pathways. There is an amphitheatre here by the edge of Silver Spring Cove. This park is dog friendly, but they must be leashed. Just across the street there are some benches overlooking the pond. 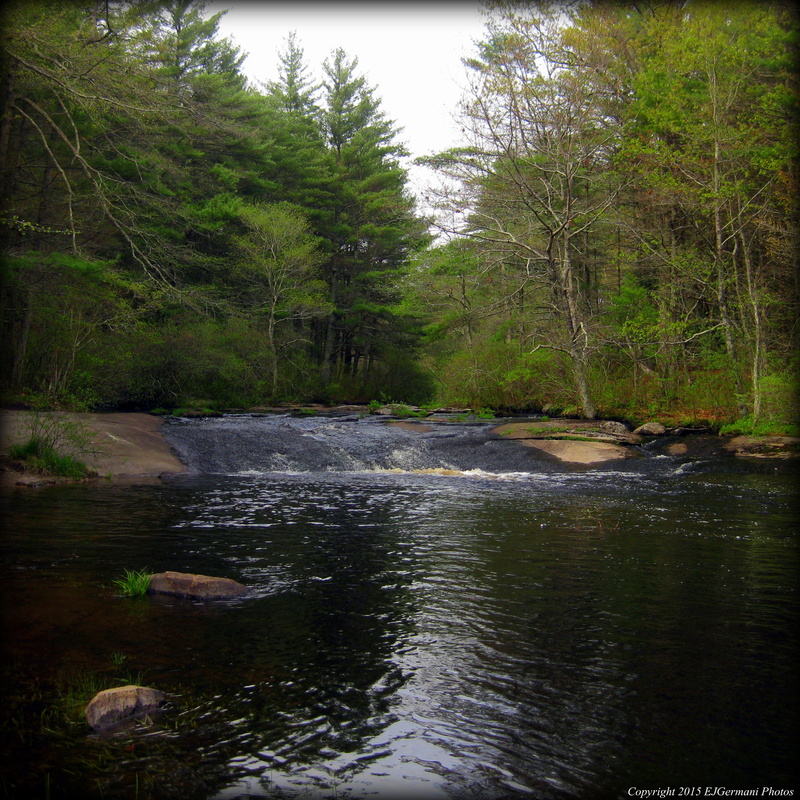 In western Coventry the Moosup River cascades over a rock formation creating a waterfall. This large boulder the width of the river is known as Spencer Rock. The beautiful natural feature is accessible from various locations throughout the Nicholas Farm Management Area, but for this hike, I choose the most direct and easiest route that follows the blue blazes of the North South trail. I started the hike from Lewis Farm Road where the Trestle Trail crosses and started hiking westward. The Trestle Trail is an old railroad bed that once was used as part of the Providence, Hartford & Fishkill Railroad. The trail to the east is under development and is becoming a bike path. This part of the trail will one day connect to the Coventry Greenway and the Washington Secondary Bike Path. But for now it remains a dirt path that was once a railroad. Within in a couple hundred feet I was crossing a narrow trestle bridge. The trestle is now paved and has chain link fence on each side for safety. It sits high above the Moosup River. From here I observed a squawking crow among the tree tops. Just on the other side of the bridge in the middle of the trail you will find a square chunk of granite with a drill hole in it. This is a granite bound used by surveyors to mark property lines and corners. With that being said, there are many side trails along this stretch, however the trails to the south lead off the management property. I continued straight along the old railroad bed that is high above the surrounding terrain. Following the blue blazes, I soon turned right onto a trail the is surrounded by mostly pine trees with an occasional oak tree and some mountain laurel. The birds were very active along this stretch. I saw several wrens here and in the distance I could here frogs. I then came upon an small grass filled field that seemed to be a haven for dragonflies. The trail bends slightly to the right, back through the trees, and down a small rocky section before coming to a dirt road. Here, look for a white pole to the right with blue blazes on it. Beyond the pole is a narrow path that leads up and over a small hill to another dirt road. 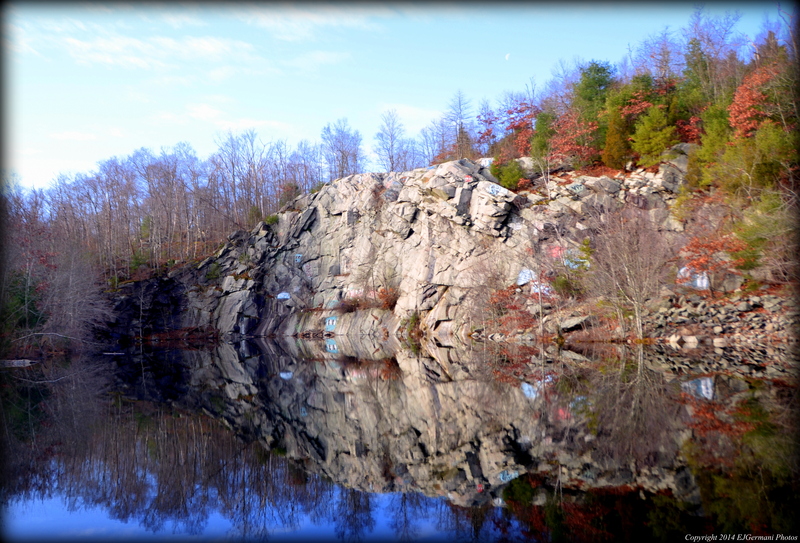 I then continue straight along the road a few steps through an open area to the river where Spencer Rock is. The rock is a large boulder that spans across the river and creates a small waterfall and the flow is very dependent on weather. I then spent some time lingering and taking in the beauty of this location for a while before retracing my steps back to the starting point. This entire hike follows the blue blazes of the North South Trail and the area is open to hunting. Be sure to wear orange during hunting season. Trail map can be found at: Spencer Rock. The Moosup River At Spencer Rock. This small town park at the end of Rocky Hollow Road overlooks Greenwich Bay. 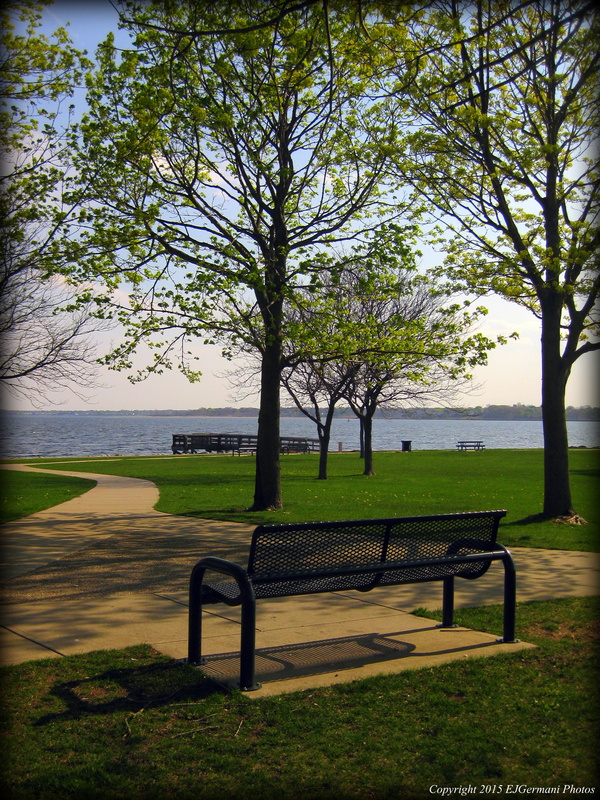 The park, though small, offers a just under a mile of walking trails with plenty of benches to sit and view the bay. The park is also popular with locals to bring their dogs. Greenwich Bay once was one of the best shell fishing locations in Rhode Island. Scallops were the main catch here. Therefore this area became known as Scalloptown. Over the years, the area the park sits on became the town landfill. The landfill eventually was capped and the park was built over it. Today it is a nice little spot, lesser known, hidden along the shore of the bay. Fall Foliage Along Greenwich Bay. Sabin Point Park is a waterfront park in East Providence. The point juts out into the Providence River allowing for panoramic views of the river. To the north the Port of Providence and the downtown skyline are visible from here. To the west and southwest you can see the shore of Warwick, and to the south you can see Conimicut Point and its lighthouse. The Ponham Rocks Light is also visible from Sabin Point. Until 1968, there was a lighthouse at Sabin Point as well. It is now marked by a day beacon. The river at Sabin Point is about a mile wide and is heavily used both for recreation and shipping. It is just as common to see large ships making their way to the Port of Providence as it to see a sailboat or speedboat. The park features about a half mile of paved walking paths, basketball courts, and a playground among its trees and green grass. There is also a fishing dock and boat ramp here as well. It is a bustling little neighborhood park in the warmer months of the year. Sabin Point Park Overlooking The Providence River. EXERCISE EXTREME CAUTION NEAR THE EDGES OF THE CLIFFS. I ventured into the Freetown State Forest for the first of three planned hikes. This morning I choose to do the southern end of the forest. I was joined by a small group of hikers. We started from a parking area along Bell Rock Road. There are two trail heads here. We took the one by the large sign at the south end of the lot. The trail here is short, narrow, and well rutted from ATV use. It leads to a dirt road named Haskell Path. At the end of the trail we came to a gate. We turned right onto Haskell Path and followed it slightly downhill to a four way intersection with gates, passing several side trails we ignored. At the four way intersection we turned left onto a trail named Ledge Road. The road continues downhill and is flanked by the forest. We soon approached a fork in the road. We stayed to the left and continued to the a small stone bridge that crosses Rattlesnake Brook. (The road to the right would be our return route). After crossing the brook, and crossing briefly into Fall River, the road begins climbing, passing several side paths, as well as the Pond Trail and the Mothers Brook Trail. The road, well worn from the weather in areas, passes through areas of beech and pine trees. At the top of the hill a large area of ledge appears on the right. Use caution in this area. We explored the area enjoying the overlook. The view to the east looks over the pond below and the forest as far as the eye can see. We then returned to the road continuing north and started gradually going downhill. We then took a right onto the next road followed by another almost immediate right. This road leads to the shore of the pond. From here you get a good perspective of how high the ledge is. Here there is an intersection where we would turn left. 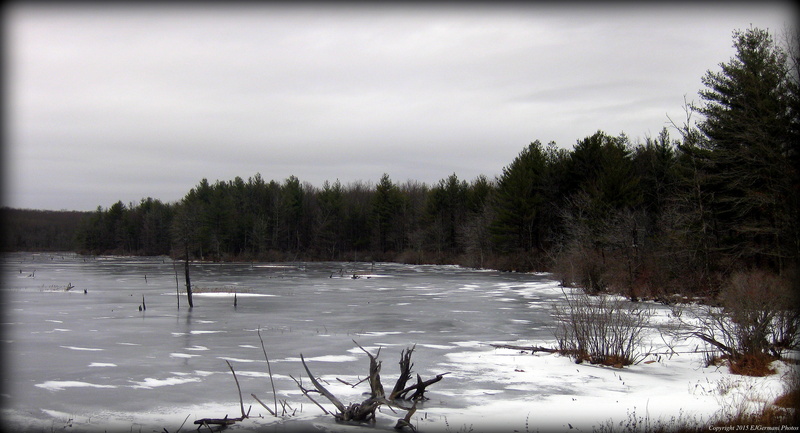 However, we explored the short road along the edge of the pond before continuing. There are a few spots to enjoy the view here and there is a waterfall as well. We then turned left at the intersection and continued the hike crossing Rattlesnake Brook once again. Shortly after the brook we encountered another fork. The trail to the left is the Wampanoag Path. We stayed to the right passing a rather large gravel pit on the left before reaching the first fork we encountered. Here we went left and retraced our steps back to the parking area. Trail map can be found at: Freetown South.